The objective of the general newsletter is to provide you with insight into important matters that transpired during the past quarter, including statistics on the 2018 production, the development of unique growers’ codes and the Macadamia Shell Innovation Challenge to be launched in May 2019. The objective of the general newsletter is to provide you with insight into important matters that transpired during the past quarter, including statistics on the 2018 production, the development of unique growers' codes and the Macadamia Shell Innovation Challenge to be launched in May 2019. 1. Statistics - South Africa is again the largest global producer of macadamia nuts - well done to our farmers!! The total crop for 2018 ended up higher than earlier estimates. In 2018, 56'550 metric tonnes of macadamias (in-shell basis, at 1,5% kernel moisture content) were produced. The graph below reflects the past 9 years' percentage increase in production, with the exception of 2016, due to the drought. According to the latest tree sales data received from nurseries for 2018, the industry is still growing rapidly. The graphs below indicate new macadamia plantings per province as well as the increase in hectares planted. Compared to 2017, "Beaumont" remains the most widely planted cultivar, followed by "A4", "816", "814", "Nelmak 2", "695" and "842". 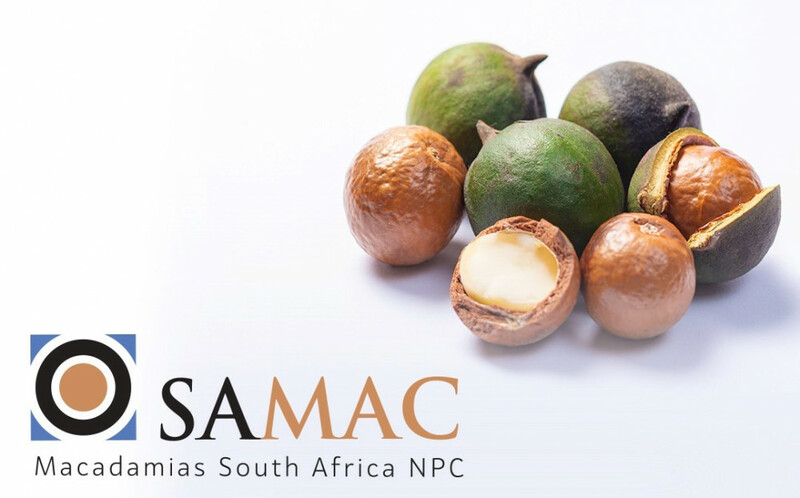 In total the value of macadamias sold in 2018 was R4'142'303'004. Using the current exchange rate of R13.93 to the US Dollar, the South African Rand value per kilogram of NIS back on farm would be between R66.59 and R69.79. With the expected growth in supply over the next few years, SAMAC has developed a proposed funding model for the non-origin marketing campaign, which will be presented to the GMC at our next teleconference in April 2019. If the model is accepted by the other participating countries, the aim is to get the process going for the first campaign to take place in 2020, to timelessly increase demand ahead of increased supply. identifying voting members at the Annual General Meeting. During an IRAC meeting held in Centurion recently, the overuse of pyrethroids on macadamias came under the spotlight. According to Dr Schalk Schoeman from the Agricultural Research Council-Tropical and Subtropical Crops, incorrect pesticide application is a growing concern. Trees in orchards are too tall and dense, with sprays not being able to penetrate, leading to wastage, poor control and the development of resistance. Schoeman emphasised that although growers are now beginning to prune their trees to combat this problem, trees in many orchards are still insufficiently penetrable for the applications, as at least a meter is required between the spray rig and the first lateral branches. He also cautioned growers on the danger of spraying programmes that rely on the frequent and widespread use of pesticides. IRAC is planning to host information sessions and publish articles later this year. Growers are encouraged to attend the sessions, as practical implementation of integrated pest management must be regarded as a priority. The establishment of an IPM working group is also envisaged for the future. The Department of Agriculture, Forestry and Fisheries (DAFF) has contracted Fruit SA to develop a new e-Certification platform for a paperless and electronic export certification process. According to DAFF, an electronic certification system will contribute towards enhanced phytosanitary risk management, fraud management, predictability in issuing of phytosanitary certificates, cost control, and efficiency. It is currently being developed for the fruit industry but will be extended to other commodities upon the successful implementation of the system in the fruit sector. With an e-Certification system all applications for phytosanitary certificates will be made online, with stakeholders at different points in the certification process accessing and supplying supplementary information online. For example, in-field, packhouse - or port inspection-associated paperwork will no longer physically accompany shipments throughout the process but will be uploaded onto the e-Certification system. The system will integrate industry-specific platforms (for example PPECB/Titan) and will be funded on a "user-pays" system. Costs associated with applications for phytosanitary certificates will therefore increase in future, with a portion of the cost of each application used to maintain the system. The timeline for the implementation of the e-Certification system for the fruit sector is still unclear, but it is expected that it will be operational in November 2019. The development of platforms for other industries will then commence, and stakeholder meetings and workshops scheduled as the process progresses. Market access, and especially the reduction of China's import levy, will remain a key priority for SAMAC. Meetings took place with DAFF to discuss strategy, however further discussions are needed, which will include participation by the Department of Trade and Industry. We trust that in the next newsletter we will be able to provide more information in this regard. As reported during the Roadshows, the development of the SAMAC App was finalised and we are awaiting the registration of the App on Google Play Store for Android and AppStore for iOS. The App will be rolled out early April 2019. The aim of the App is for growers to have a one-stop-resource with constantly updated, relevant and important information available at the touch of a button. You will receive guidelines in due course on how to register to use the App. In May/June 2019 we will launch the macadamia shell innovation challenge. The aim is to invite students and other persons to partake by presenting new and innovative ideas for the resourceful and renewable use of the macadamia nut shell. The implementation of successful transformation initiatives remains a key objective of SAMAC. The Transformation Committee met on 28 February 2019 and started formulating the long-term vision, processes, procedures and the assistance required from external project - and funding partners. The objective is to ensure that future initiatives are carefully considered and that only viable projects, which will result in an increase in black commercial farmers, are supported. During February and March 2019 all previously funded farm projects were visited. In total, over 328 hectares of macadamia trees were planted, with most producing good quality nuts. However, as further assistance is required, we have started the process to engage with potential funding partners such as Landbank, the Public Investment Corporation and the Department of Agriculture and Rural Development. As several new farmers applied for funding, and over 168 applications were received for bursaries, we will be focusing in the next quarter on obtaining additional funding partners to support our initiatives. In conclusion, we are optimistic about the year ahead and the great opportunities. The appointment of three new staff members in March 2019 will also assist towards achieving even greater heights. The new team consist of Dr Elrea Strydom (R & D Manager), Mrs Jurita van Zyl (Admin & Operations Manager) and Mr Juandre du Toit (Finance and Procurement Officer).